The climax of the first electrowawe in the 80´s. Derrick May turned the early technoscene to a organic direction one year after "Testing 1-2". And the track got forgotten. 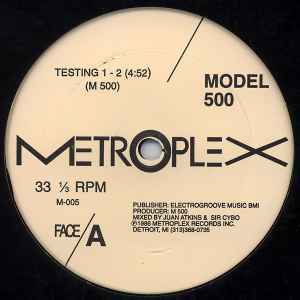 As the other early Model 500 tracks, this is heavy machine-coded electro. Frantic and sharp sounds together with a"typemachine" rhythm. Yes! You must use the word machine many times to define it. Testing 1-2 sounds machines singing under a programmers pict. Enfore.